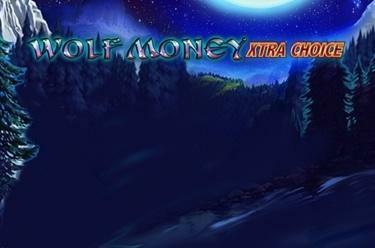 Play Wolf Money Xtra Choice online for free now! In the slot Wolf Money Xtra Choice you can choose between 1024 winning paths and up to 25 pay lines on 5 reels. 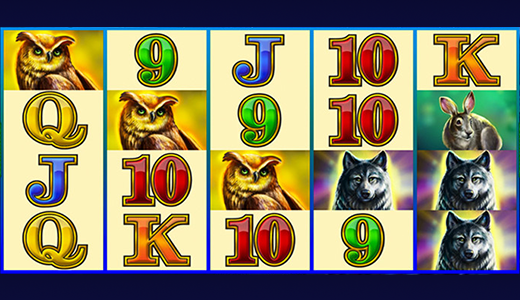 The wolf is the focal theme of the slot and it scores the highest winnings along with the Scatter. Your aim in Wolf Money Xtra Choice is to line up 5 identical winning symbols on one of the lines or winning paths. All winning patterns start on the left reel set and finish on the right reel set. The Scatter symbol is the silver coin showing the wolf: This pays out a win and triggers free games if it lands at least 3 times in any position on the reels. The moon (Wild symbol) increases your odds for Twist winnings because it substitutes for all slot symbols (except for Scatter). With this version the Xtra-Choice-Feature is triggered if 3, 4 or 5 Scatter land in any position on the reels (or randomly following a spin). Here you can choose between 5 different free games with varying multipliers (2 to 4) and different numbers of free games (10 to 22). If you land a correct symbol combo featuring a moon symbol during the free games the winnings are quadrupled with the selected multiplier. If you have selected this variant, 3, 4 or 5 Scatters anywhere on the reels trigger 15 free games; these can also start randomly following a spin. During free games each win earned with a correct symbol combo featuring a moon is doubled or quadrupled. In both free game versions additional free spins can be won at random following a spin or with 3 to 5 Scatters. The settings of the regular game (number of lines or winning paths and bet multiplier) are carried over to the free games. Free and wild like a wolf - breath woodland air along with the pack of the slot Wolf Money Xtra Choice in the vast North American high plains! Together you roam through the reel forests at night and hunt for Twists hidden in the undergrowth. Being the leader of the pack you have special skills: You decide on how many paths - 1024 winning paths or 25 pay lines - you look for winning prey with your pack!